If you're one of those "suckers," at least you've got company. I'm a sucker too. All this time, I thought working hard for my money and staying debt free was wise. I thought sticking with one credit card - paying down the balance every month, no exceptions - was prudent. I thought driving a five-year-old car - fully paid off, nothing flashy - was a sensible thing to do. Nope. Turns out those were sucker moves. What I should have done, to be in synch with this economy, was to have bought a 3,000-square-foot McMansion at the peak of the bubble... pulled out a cool hundred thousand in home equity loans... and then defaulted on the place. That way I could have had the cash for a jet ski and a new convertible and a Hawaiian vacation - you know, the means of living in style - without having to worry about a thing. 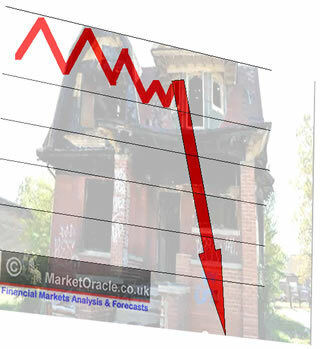 Two weeks ago your humble editor asked, "Did the Housing Bust Fuel the Consumer Spending Binge?" In that piece, it was explained step by step how the phenomenon of "strategic defaults," i.e. homeowners walking away from their mortgages, may have fueled a surge in retail spending by way of freeing up cash. As it turns out, it looks like the strategic default thesis was correct. And this helps show why those who were expecting a "new normal" got it wrong. See, guys like Mohamed El-Erian at Pimco (and yours truly) at first thought the "new normal" meant consumers tightening up and living within their means. What we failed to realize is that "new normal" actually translated to "NO MORALS," as in "deadbeats ripping off the banks with abandon" (while the banks in turn screw the taxpayers). My 25 year old niece had $10,000 of outstanding credit card debt. Recently, she told the bank she couldn't pay. She is not unemployed so the 'hardship' is all relative. Nevertheless, the bank offered her a concession which she refused. They offered another concession, she refused again. Finally, they told her if she paid $150/month for 2 years (total of only $3600 with no interest), they would call it paid in full! She accepted in a heartbeat. It is less than a month later, and she celebrated her good fortune by going on a cruise to Hawaii. A friend owns a small manufacturing co. He tells me of one of his female employees who was saddled with a $450,000 home she purchased almost five years ago with no down pmt. One year after her purchase she pulled $75,000 home equity and purchased 'fun stuff' including a boat. She recently walked away from the house (now saddled with $525K mortgage), purchased a new house for $200,000 (in her sister's name) and kept all the goodies purchased from the home equity withdrawal. With the much lower mortgage payment she just bought a new car. Almost everyone in my "survey" is aware of, or knows someone living rent free in their home for an extended period of time, having stopped paying their mortgage. Many of these free boarders are spending lavishly on non-essentials. My hard-working part-time assistant knows two different 35+ yr olds who have enjoyed over 9 months (one is up to month eleven) of rent-free living in very nice homes they purchased in 2004/2005! Both are employed and both enjoy a non-frugal lifestyle. My assistant wonders if he should do the same or have me pay him more so that he too can enjoy the 'good life'. My sister is a nurse with 25+ years on the job. She told me of a young couple that she is good friends with that both work at her hospital making a decent joint income. They didn't like the fact that they grossly overpaid for their 3000 sq ft home in 2006. They stopped making hefty monthly payments six months ago and haven't yet been contacted by the bank. They have decided to wait until contacted and then walk away. In the meantime, they just returned from NYC from a week vacation in the Big Apple. My brother-in-law wanted to know if he should stop making payments on everything. He lives in Virginia and his carpentry skills are not as marketable as they were in the height of the boom. He and his wife's best friend have lived close-by for many years. For the past 13 months since they strategically decided to stop paying their mortgage, they had yet to be contacted by their bank. Not even one letter! My brother-in-law doesn't understand how they get to pocket the mortgage and spend carefree, including a 10-day Caribbean vacation. Apparently there are lots more anecdotes of this type - potentially "millions of similar stories across the country." I thought I was about as cynical as I could get. I thought that, after the initial outrage of the bailouts, my anger was all but spent. But this makes me feel righteously ticked off all over again. Why be furious? A few reasons. First of all, because these happy-go-lucky knuckleheads spending strategic default "mad money" like water have the attitudes of fiscal dope fiends. They are likely going to go broke again en masse, or otherwise need bailing out, and someone else will have to pay. AGAIN. Second of all, because it's just damn disgusting that those people who scrimped and saved to own their homes and pay their debts - i.e. the "suckers" who lived by a moral code of personal obligation and free market ethics - have to see such blatant debauchery not just flaunted, but rewarded by the system. It's a breakdown of ethics and common sense that threatens the future of the country as a whole. To understand why the banks don't really care about strategic default losses - why they can let defaulters go a year or more without so much as a slap on the wrist - take a look at the following chart from Gluskin Sheff. 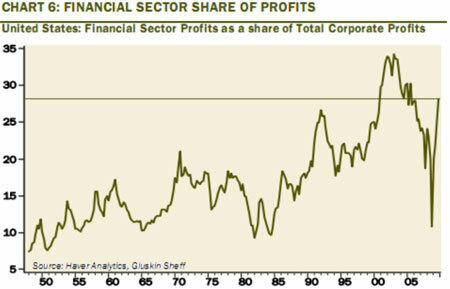 The chart shows the financial sector's profits as a percentage of all corporate profits in total. Before the crisis hit, the financial sector had worked its way up to more than a third of all corporate profits at the peak - an obscene number in itself. Thirty-three cents out of every dollar earned by way of financial engineering? You don't see that kind of imbalance in a healthy economy... only in a paper casino "phinance" economy, where the "ph" is for phony. As the financial crisis took hold, the financial sector's profits plummeted, which the chart shows. But then, post crisis, they bounced back with a vertical vengeance. See that rocket ride on the right side of the chart? It comes courtesy of the Federal Reserve and U.S. Treasury, finding any way they can to shovel huge profits into Wall Street's pockets. At the taxpayer's and saver's expense. Lavish-spending "strategic defaulters" feel justified in ripping off the banks. The lawless deadbeat culture spreads - as sparked by the banks' own example. The banks don't care because they are in the rip-off game too, on a larger scale. The banks can ignore strategic defaults by way of taxpayer-funded profits. The whole thing winds up being a backdoor political transfer. Washington pumps torrents of money into the rotten banks. The banks look the other way as strategic defaulters catch on that "the way to play the game" is to defraud, deny and spend. And politicians get to enjoy the illusion of recovery. So how are the banks ripping off the taxpayer, you ask? By way of the record steep yield curve. In keeping short-term rates near zero, the Federal Reserve has given the banks a license to print money. Thanks to Ben Bernanke, banks can borrow as much as they want for practically nothing... plow that cash into longer-dated U.S. Treasuries... and make perpetually huge profits with little to no risk. It's like a permanent backdoor bailout subsidy. Meanwhile, again, the powers that be, to the extent they truly know what is going on, are happy about the strategic default situation. They see the defaults and rampant spending binges as a good thing. Why? Because all that "mad money" creates the illusion of a healthy consumer! All these jokers going out to buy new cars and Hawaiian vacations and whatnot are fueling a new spending surge, which in turn boosts corporate earnings, which in turn gets Wall Street cheering and the average citizen thinking "hey, things are okay." And as for the banks - why should they trip over pennies on their way to dollars? The big banks have far more money coming in by way of the Federal Reserve's magic gift (zero interest rate policy) than they do going out. Zero interest rates are a cruel punishment for savers, especially elderly savers. Backdoor inflation (via the creation of excess reserves) is a means of rewarding profligate debtors and punishing savers harshly (making "suckers" of them). Businesses are gearing up based on the notion that this consumer spending surge is sustainable, when in actuality it's a giant mirage. The massive profits being accrued by the banks are pooling disproportionately in the pockets of fat cats and deeply connected investment players (as usual). The real backbone of America's economy - small business - is still being neglected. So are genuine savers. The up-and-coming generations - the children that will inherit all the debt being created - are in some ways the most voiceless victims of all in this scheme. Meanwhile, even as corporate America rejoices, small business continues to starve. According to a recent survey from the National Federation of Independent Business (NFIB), the credit picture is worsening for small business now. Despite all the hoopla, the employers of more than half of America's workforce have reason for pessimism, not optimism, in the quarters ahead. But who cares, right? The economic recovery, or at least the illusion of it, will be carried on by the revolutionary rip-off machine. The Federal Reserve has found a neat new way to funnel cash into the hands of those who least deserve it, just as it did with AIG. And taxpayers and savers - the few of them left that is - will just keep getting squeezed on both sides. An estimated 47% of Americans pay no taxes at all... and the fat cats at the top of the oligarchy ladder certainly get a lot more out of the system than they put in. So that leaves the "suckers" in the middle (i.e. you and me) to pay the final tab. For all of it. The whole rotten thing. To be honest, I don't really know what to think of my country any more. This ridiculous, debauchery-ridden, quasi-socialist Ponzi-scheme of a recovery is going to end in absolute disaster. Crushing deflation, hyperinflation, heck, maybe even martial law... it could all be coming down the pike, in wave after debilitating wave, when the music finally stops. your article makes good points. But the quote that “a democracy will continue to exist up until the time that voters discover that they can vote themselves generous gifts from the public treasury” is a superficial inaccuracy for analyzing our current malaise. When the bulk of government spending is now used for wars and corporate subsidies, it is false to conclude that government bankruptcy is being caused by overly generous gifts to the “majority”. When taxes raised for Social Security are instead spent for wars and corporate subsidies, it is false to conclude the majority is demanding benefits they haven’t paid for. When health care costs are doubled to protect corporate profits, and preventative health protection downplays the deleterious effects of fast factory foods, work safety, and environmental polluters, it is false to contend that health costs are being driven by the “majority” receiving unreasonable generosity. Instead, what we have is an elite minority, who through lobbyists and largesse have captured not just regulatory agencies, but “representative” government itself. Government itself is now being misused to siphon wealth from the public majority and transfer it upward. Far from voting themselves generous gifts, the majority of voters can hardly get representation to get a fair deal. And both government and corporate leaders collude in preventing the general public from gaining full knowledge about all the “privileged information” and backroom deals. martial law?? nah... you can't pay soldiers if your bank account is already below 0. I agree with Herve' that those things are exactly what will happen. plus that when the wall street bankers are in trouble, (Goldman, JP Morgan, and the rest) War is on the way. uh.. a big one. I feel for you. However, not being a taxpayer or a servant of the banks paying usury, I and my children do not and are not going to pay for your lack of guidance as to avoiding such things. I don't have a McMansion, but at least its paid for. Yeah, i know. We that actually practice scripture are not welcome. All this trouble coming against we that had nothing to do with your errors. Having read many of the most current articles here at the MarketOracleUK, it seems to me that the near universal consensus is "Doom and Gloom", but the most likely and worst end result is hardly or not at all mentioned (i.e. United States monetary failure and crash of the US dollar). This would be a big difference between this uncoming great recession and that of the 1930's. On second thought, only the Chinese economists seem really concerned about this, and what do the Chinese know? It's generally acknowledged that American federal government economists (e.g. Ben Bernanke) are the best in the world, so not to worry!. 21 Apr 10, 21:04 Actually practice scripture? Good for you Ed, BTW how many slaves do you keep? It gets more obvious with each passing day: "Something is rotten in Washington"! It's only a minority that's doing that. Their actions are on file, the facts are recorded and there is lots of time to act on it. I think *all* so called loans from banks are immoral on their face. We have a fiat currency system and fractional reserve "loans". That whole conjob system needs to be abolished. Yes, I feel for people who played by their rules, but the game comes pre rigged, too, and banker's so called profits are immoral as all get out. And exactly *why* would people want to participate in that anyway, and go along with that system? all it takes is a few hours history lessons and some research to see it is crooked. The best propaganda film ever made..It's a wonderful life. I am neo-geezer age now and have *never* taken a bank loan for a single thing. Paid cash for used cars, and owner financed homes only, never through a bank. Nor would I ever buy a wall street stock, nor any government "paper" except for a few savings bonds I got faked out into getting as a kid, because I refuse to support crooks and grifters, and refuse to put my neighbor into debt with government bonds or whatever. The whole system is crooked and a scam and I have known that since junior high school, so I act accordingly. Either go all the way on what is moral or not, or don't bother preaching about it. I just am not seeing the scam banksters/gangsters getting scammed back as any valid white hat/black hat good versus evil thing, all I see is conjobbers getting conned themselves with these strategic defaults. If people have paid them back around ten percent total, that's it, that's all the real money that was there in the first place, very generally speaking. Now, I wouldn't do it myself..but I wouldn't apply for a loan either. I'd do a build as you can afford it on land (which is an extremely cheap way to have a nice home), or owner financed (more expensive for the impatient who can't wait, or work simple hand tools), something like that, but never anything to do with that ridiculous fractional reserve racket. It isn't ethical at all. As to the upcoming crash, saw it coming some years ago, relocated to a farm now where we are almost totally self sufficient, as in, not needing much in the way iof bernankebingobux to live on. Best plan B I could come up with. Tangibles rule, history teaches us this. I have never read so much unsubstantiated rubbish in all my life. Don't give us stories, give us FACTS!